When you have exported email subscribers from an existing email service provider in a .csv file and it contains “bounced & unsubscribed emails”. Then, you can add these “bounced & unsubscribed emails” inside your particular email list of your EasySendy Drip (or EasySendy Pro) account. 1. 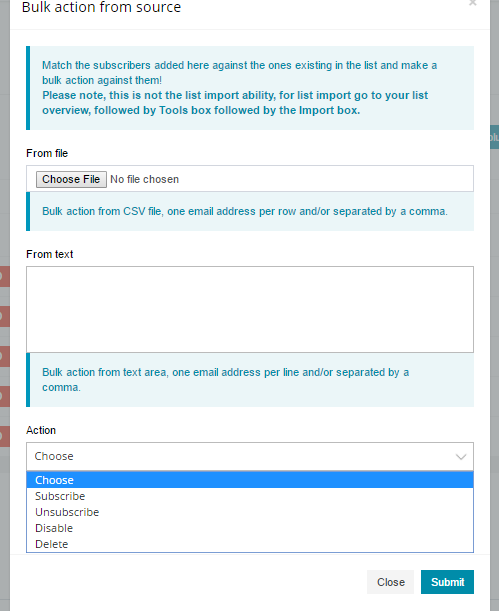 Select an email list then, select “Subscribers”. 2. Click on button “Bulk action from source“. 3. Inside new popup, you can either upload or paste the email list and select “Unsubscribe” action according to the email of yours. Match the subscribers added here against the ones existing in the list and make a bulk action against them! You can use this tool to mass subscribe and delete email subscribers in this email list at once too. Email subscribers with unsubscribe / blacklist status in one list can be active in other email list, they can receive emails when campaign sent to that particular email list. PS: This is not the list import ability, for list import go to your list overview, followed by Tools box followed by the Import box.